Some people say the first step to starting a successful business is to have a clearly defined vision. For others it may be a revolutionary product that solves a need. Hundreds of books have flooded the network marketing profession, all claiming to share that certain “nugget of truth” that is supposed to deliver your goals and dreams. So why read this one? 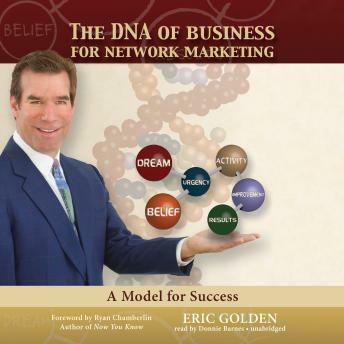 The DNA of Business for Network Marketing offers proven concepts that will explain why you are working too hard and thinking too much. That said, this is not a fix-it audiobook; it’s a live-it audiobook. Each element—dream, belief, urgency, activity, improvement, and results—as defined by the DNA-b model will be explained. You will come to quickly understand that modifying your “business DNA” will drive you to achieve the lifestyle you are looking for. It is truly within your grasp—and under your control. “Eric Golden takes a surprising approach to understanding business success by studying the behaviors of high earners. By understanding the DNA of business, readers are put on a fast track to achieving their dreams. This book is a must-read for everyone involved in network marketing.”—Bryan Heathman, president, Made for Success, Inc.